Start off your visit on the 10th (Fri): relax and rejuvenate at some of the best spas, identify plant and animal life at Sacred Monkey Forest Sanctuary, then view the masterpieces at Threads of Life, and finally contemplate in the serene atmosphere at Saraswati Temple. Keep things going the next day: don't miss a visit to Tegalalang Rice Terrace, look for all kinds of wild species at Elephant Safari Park, then contemplate in the serene atmosphere at Tirta Empul Temple, and finally explore the fascinating underground world of Elephant Cave Ubud. For more things to do, ratings, photos, and more tourist information, refer to the Ubud travel itinerary planner . Laredo, USA to Ubud is an approximately 29-hour flight. The time zone difference when traveling from Laredo to Ubud is 14 hours. Expect a daytime high around 87°F in May, and nighttime lows around 76°F. Finish your sightseeing early on the 11th (Sat) so you can drive to Seminyak. 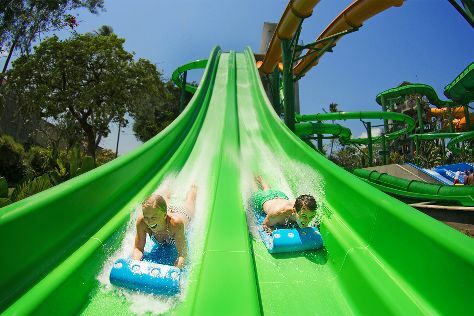 On the 12th (Sun), get your game on at Tilo Kids Club and then make a splash at Waterbom Bali. Get ready for a full day of sightseeing on the 13th (Mon): indulge in some personalized pampering at some of the best spas, browse the exhibits of Nacivet Art Gallery, and then contemplate in the serene atmosphere at Tanah Lot Temple. To see ratings, reviews, maps, and tourist information, go to the Seminyak trip planner . Seminyak is very close to Ubud. In May in Seminyak, expect temperatures between 87°F during the day and 76°F at night. Finish your sightseeing early on the 13th (Mon) to allow enough time to travel back home.